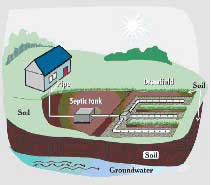 A septic tank is the first component of a septic system which is an onsite sewage treatment and disposal system. The second component is the drainfield where sewage is “disposed” of in the soil. These systems serve those sites without connections to municipal sewage treatment plants. A septic system can be a conventional septic system, a low pressure pipe septic system, aerobic treatment septic system, nitrogen reducing septic system, nutrient reducing septic system or a performance base treatment system. A mound system produces an unsightly “hump” and can occupy a significant amount of space because of shoulder and sideslope requirements. A 4-foot shoulder is required around the drainfield and then the sideslope. The shoulder and sideslope can add 18 feet or more to the total length and width of the area occupied by the drainfield. Aerobic treatment-ATU-drip irrigation systems can be installed in place of the conventional system. In doing so, the mound height is reduced by a minimum of 12-15 inches and the overall footprint is reduced by about 50%. Best of all, aerobic treatment-ATU-drip irrigation systems can be installed at the same cost as the conventional mound: USUALLY LESS because they require significantly less fill. In addition, certain soil conditions are not required to be removed or excavated when using an aerobic treatment-ATU-drip irrigation system. This further reduces the cost of the system. 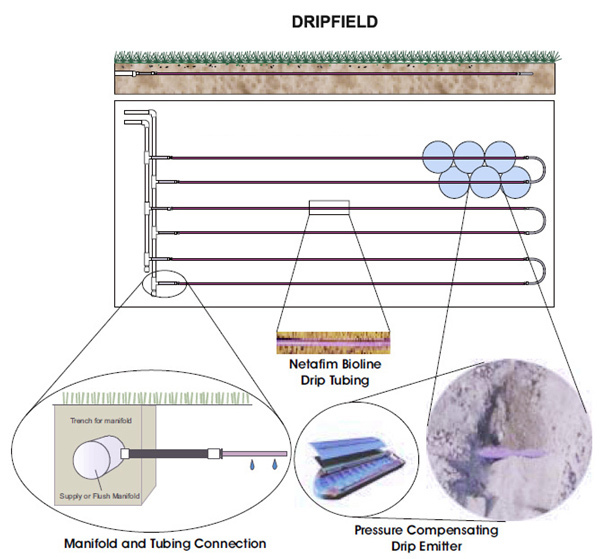 A low pressure pipe system is required when the drainfield square-footage exceeds 1000 square feet. This system is set up with PVC pipe inside the conventional drainfield to distribute the effluent evenly throughout the entire absorption area. This system requires a pump and can be installed below or above ground. Aerobic treatment (ATU)/drip irrigation systems can be installed in place of the LPP and is almost always less expensive. Click on the products below for more information about each.